Want to reduce some stress? Maybe you have ridden before, or maybe this is your first time. Climb up on one of our beautiful horses and feel your stress melt away! The basic trail experience takes you through miles of winding trails. 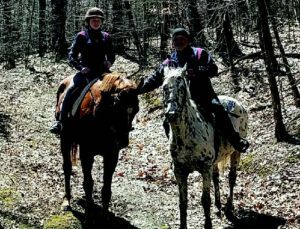 Learn how to create a bond with yourself and your horse whether you choose to ride privately or join up with another for a small group. about any adventure. Getting engaged? Want to celebrate something? Cowboying up? The ride comprises 2 hours in the saddle and a thirty minute stop over either creekside or in the rolling hills with panoramic views for a wine & cheese or beer & BBQ wings picnic. winding trails as someone else captures those precious moments! 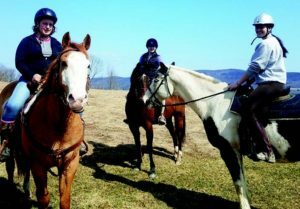 Take a friend on a riding experience through miles of private trails and beautiful vistas. Channel your inner cowgirl. Stop along the way, tie up your horses and indulge in a customized surprise in the woods. This is created for those women and girls who like to laugh, challenge themselves on multiple levels and are open to whatever comes up. We will ask you to share some thoughts with us prior to your booking so that we may craft something meaningful. Pricing available upon request for all packages.